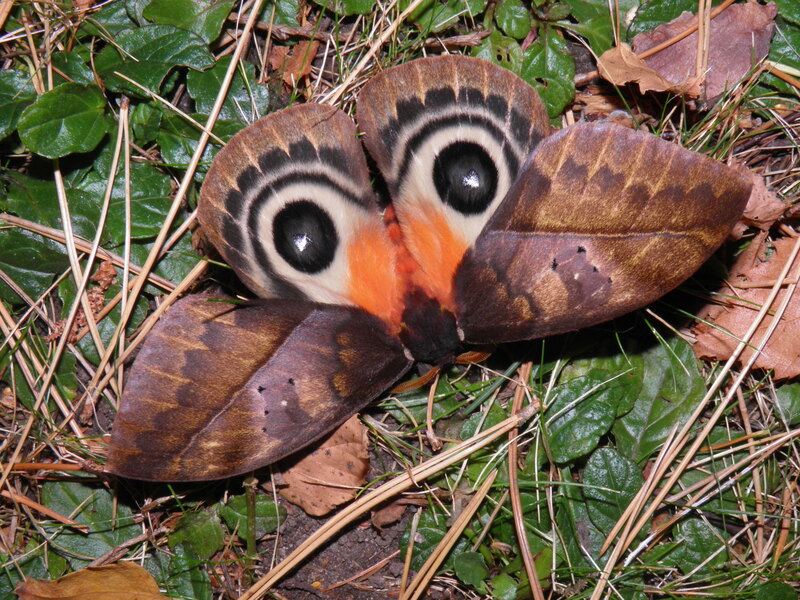 Automeris niepelti — “Niepelt’s eyed silkmoth” | Welcome, visitor! There are a lot of Automeris species in the world: over 124 of them, in fact, and counting. Being one of the most speciose genera of silkmoths, there is a lot to discover for entomologists and hobbyists that appreciate Saturniidae. Automeris species are generally small(ish) silkmoths with wingspans between 40mm and 100mm. However, there are exceptions to this rule. In the jungles of South America, there are a few hidden giants with wingspans over 140mm+. This page is about one of them, that I sourced from Ecuador. Automeris cf. 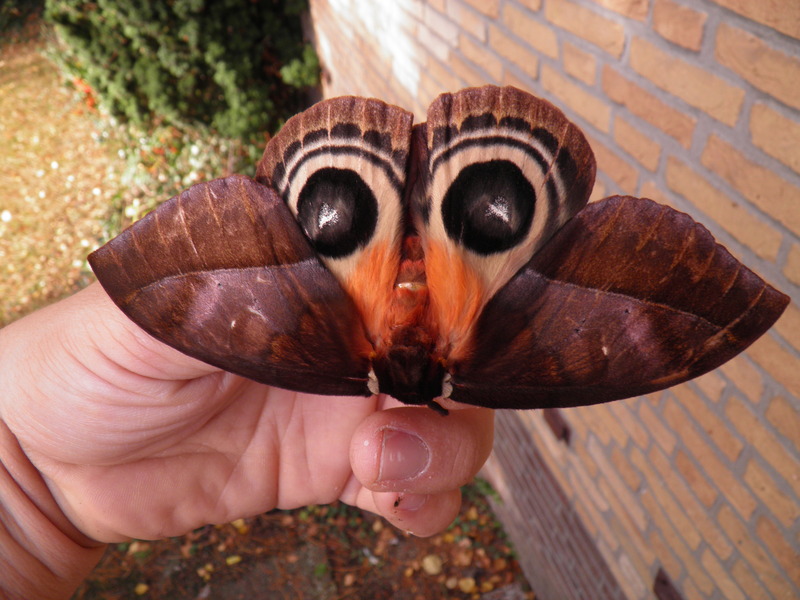 niepelti is a very big species of Automeris, with a wingspan ranging from 100mm to 160mm (16cm)! 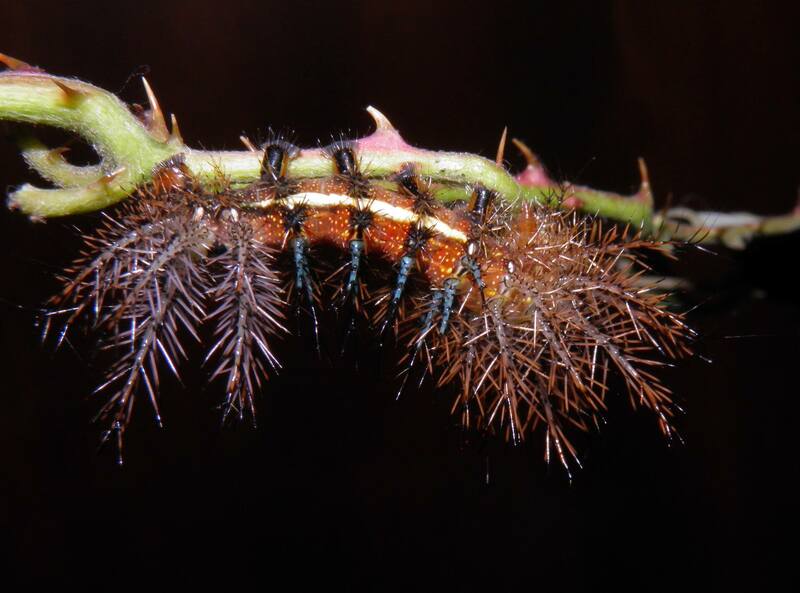 Like all Automeris species, these moths produce large larvae covered with big urticating spines that can inject venom and cause contact urticaria. Hold on. Automeris “cf” niepelti? What does the mysterious cf. in front of the species stand for? Well, the abbreviation cf. is Latin, and means compare (conferatur). This abbreviation is included in a species name, if one is unsure about the ID of species. You see, in South America there is a whole group, a species complex rather, of similar looking moths. In what is called the egeus species group there are about 14 known species of Automeris that all look similar, but are different species in reality. To name most of them: Automeris egeus, boops, larra, niepelti, silkae, tatiae, postalbida, paregeus, mixtus, paralarra, vanschaycki, anikmeisterae, niepelti.. luckily, I knew the locality where the cocoons of this species where collected: in Ecuador. In this country, only larra, niepelti, egeus, postalbida and boops have been recorded. “A. postalbida is from western Ecuador. Larra is from eastern Ecuador, and A. niepelti, which is also very similar, is from western Ecuador. The high elevation of the Andes seems to be a consistent barrier between different sets of species. I would not rule out niepelti if from western Ecuador. If you know location, you can narrow choices a bit.” – Bill Oehlke. 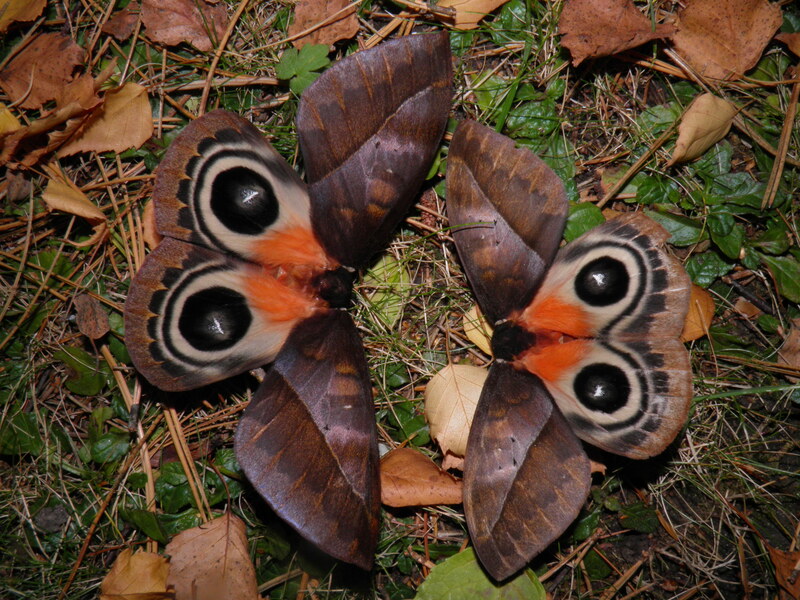 The moths came from western Ecuador (Maldonado). So that leaves about two options – niepelti, or postalbida, since species like boops can be ruled out by their eyespots, and species like larra by their geographic distribution. I am still not really sure if this moth here is postalbida or niepelti, but based on their appearance and some specimens I have seen- to me the best match is Automeris niepelti. I am however not 100% sure. And I don’t think I can ever be 100% sure, unless I DNA test them. So that is where the cf. comes in: it means it is most likely niepelti, but I am not sure. I have saved specimens of this moth however, and I plan to subject them to DNA tests later, of which the results will be published in this article – stay tuned. Compared to most species of silkmoth, the eggs of Automeris niepelti take quite some time to hatch. 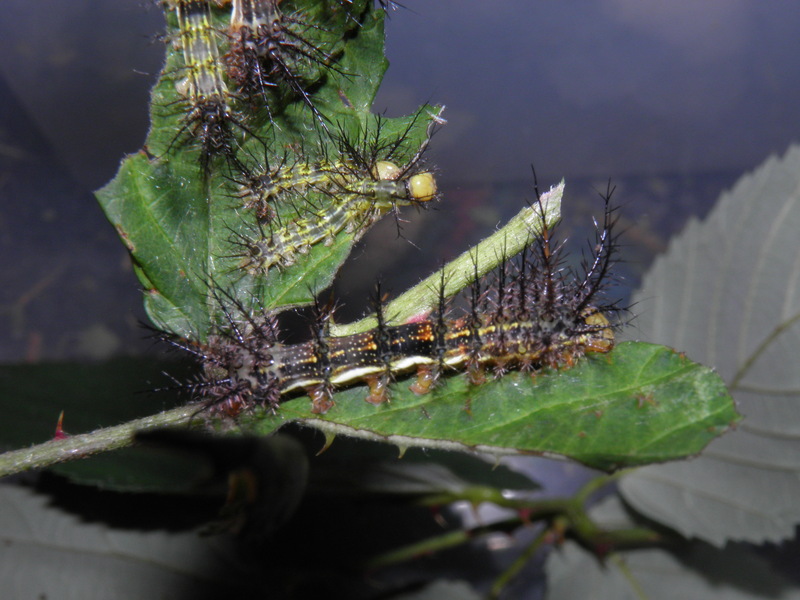 In fact, it took 1.5 month (about 6 weeks) since the first pairing for the first caterpillars to show up! This longer development time is actually not unusual for the large species of Automeris (and some other Hemileucinae). They don’t need any special care and can be kept on room temperature, although a light misting with water is appreciated by this tropical species, and stimulates the developed larvae to hatch from their eggs. The young caterpillars of Automeris niepelti are small, yellow and gregarious (that means they are social and live in groups). Because I paired this species in the middle of winter (December) I was unable to test any food plants for them but bramble (Rubus fruticosus). Bramble is an evergreen plant in Europe that is accepted by a wide range of Automeris species, and some Automeris have been observed to feed on it in the wild too. It is also a Rosaceae – a relative of fruit trees such as cherry and apple, which are also commonly used host plants for the more polyphagous Automeris species. 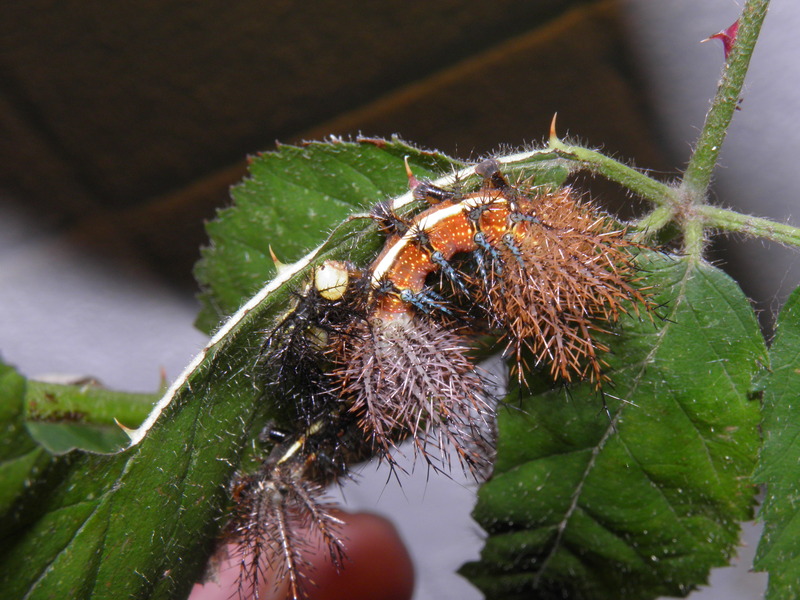 However, Bramble isn’t an optimal plant for most of them, and while it is possible to raise many Automeris species on it, it is often accompanied by a higher mortality rate. In winter in Europe most of the trees and shrubs drop their leaves, leaving only a limited amount of plants available for hobbyists. In conclusion, I had no other choice. However, I suspect that Automeris niepelti will feed on a big selection of food plants – potentially including oak (Quercus), beech (Fagus), willow (Salix), cherry (Prunus), apple (Malus), rose (Rosa), fig (Ficus), Guatteria, Heliconia, Hirtella, Pentagonia, guava (Psidium guava), Alfarao, Ocotea, several types of Fabaceae (Inga, Robinia) and more. This is based on the food plants used by its polyphagous cousins (A. larra, postalbida, egeus). Automeris niepelti are very tolerant of humidity, and can be raised in plastic boxes from egg to cocoon. They do not need much ventilation at all, though make sure not to give them “wet” food plants or spray them if you decide to raise them in an unventilated environment. Condensation in plastic boxes is recipe for disaster (infection by viruses, fungi, bacteria and pathogens) and should be avoided – they do not need to be sprayed. 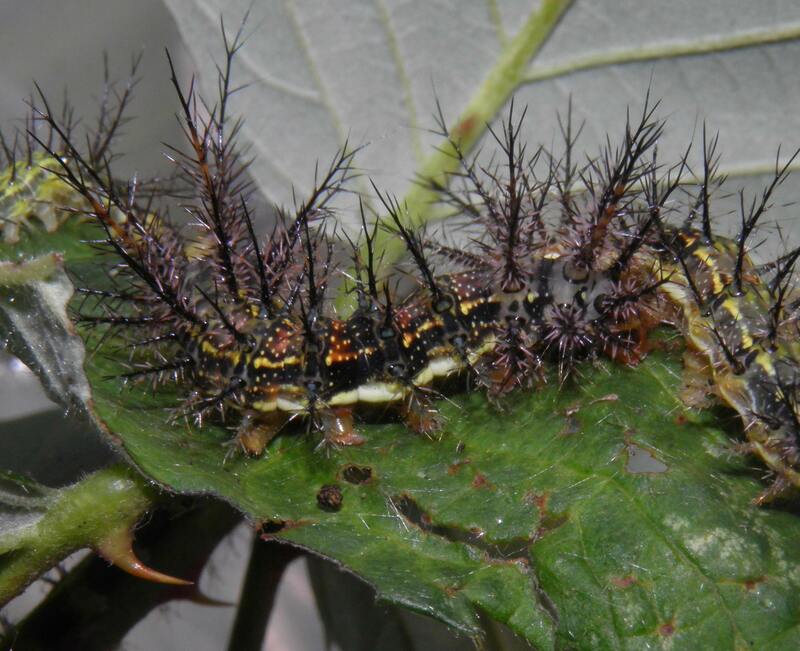 The first two instars are yellow with black spikes, but the third instar becomes quite beautiful – black with accents of golden yellow and orange. 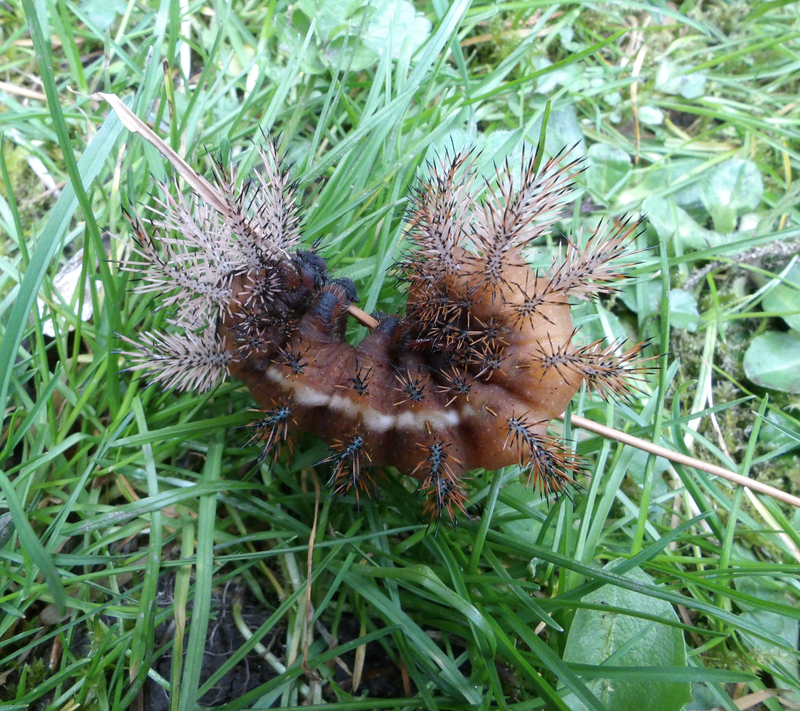 After the larvae become L4, they turn brown with iridescent blue spikes. After shedding their skin their are particulary beautiful, with pink, yellow and blue pigments (sadly, a fake photoshopped picture of Automeris larra after shedding its skin went viral – yes the larvae are pretty, but they don’t have the rainbow colours you saw online). 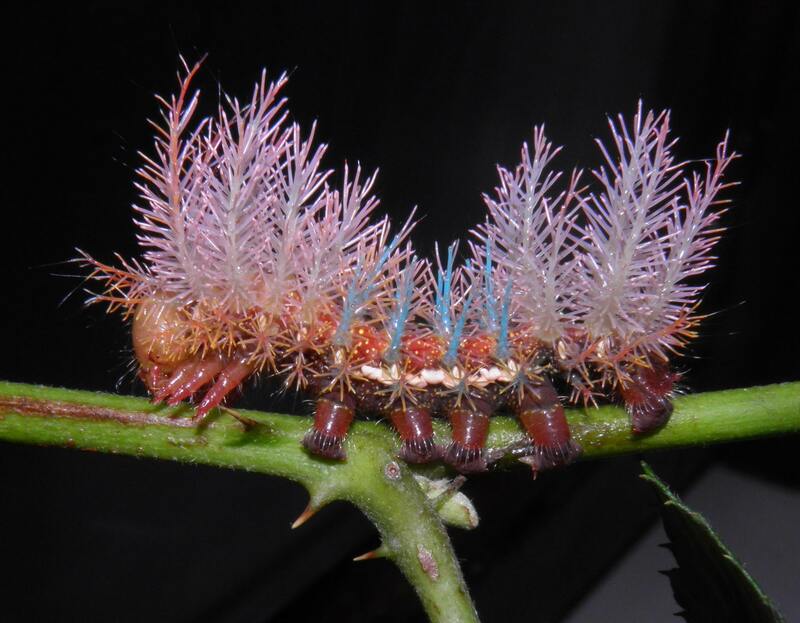 The larvae of Automeris niepelti sure look impressive and very colourful – and to top it off, they have beautiful and threatening looking spines. The thorarical and rear end spines are prolonged. If molested, the larvae can curl up in a ball, protecting its head with the spines on its rear end. While not strictly dangerous, keep in mind that the sting can be painful. Allergic or sensitive people may prefer to use gloves if they are taking care of the larvae, although there is no reason to touch them unless it is by mistake – if you are a bit careful and gentle, it is easy to avoid their spines and everyone should be able to raise them without getting stung. 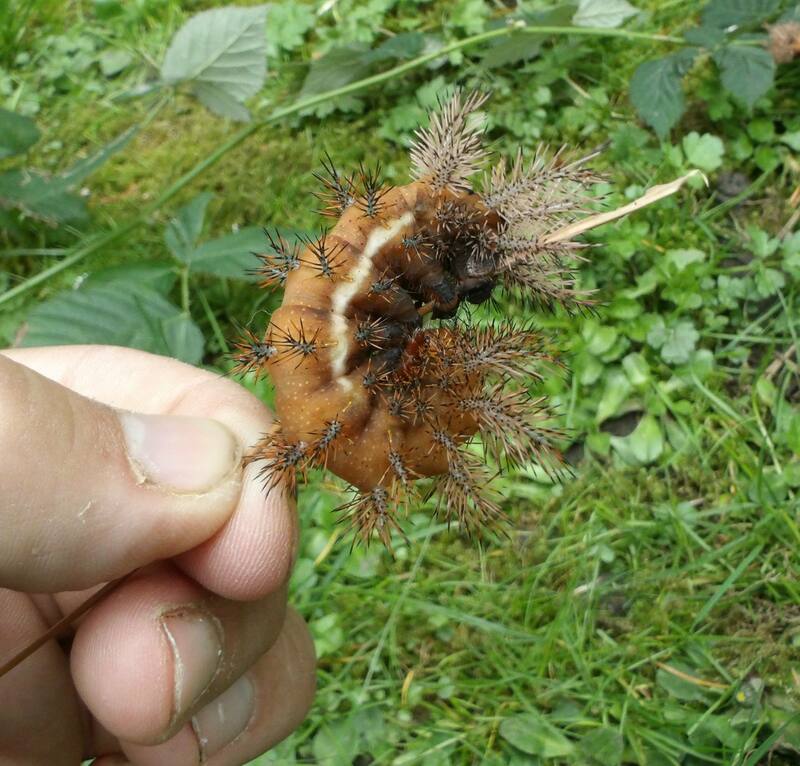 Over time, the larvae will end up looking like bigger versions of themselves – and caterpillars of this large species can grow to over 10cm in length. Before they are ready to pupate, their iridescent blue spines become grather “grey” instead of blue, and the larvae shrink in size and become chubby. It isn’t until 3-4 days later however, that they begin to spin cocoons suspended in the leaves of the food plants. 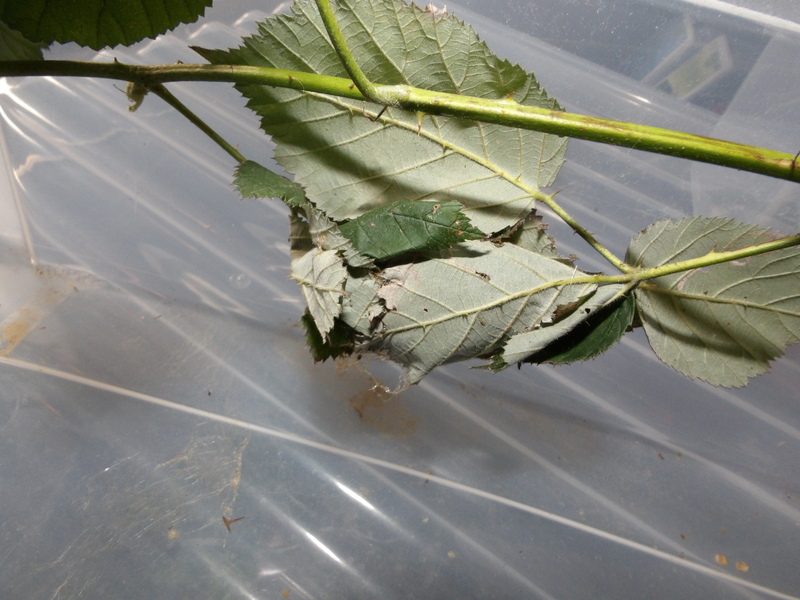 If possible, they cover their cocoons entirely with leaves, although that is not always possible for them in captivity. The cocoon is thin, brown and papery. 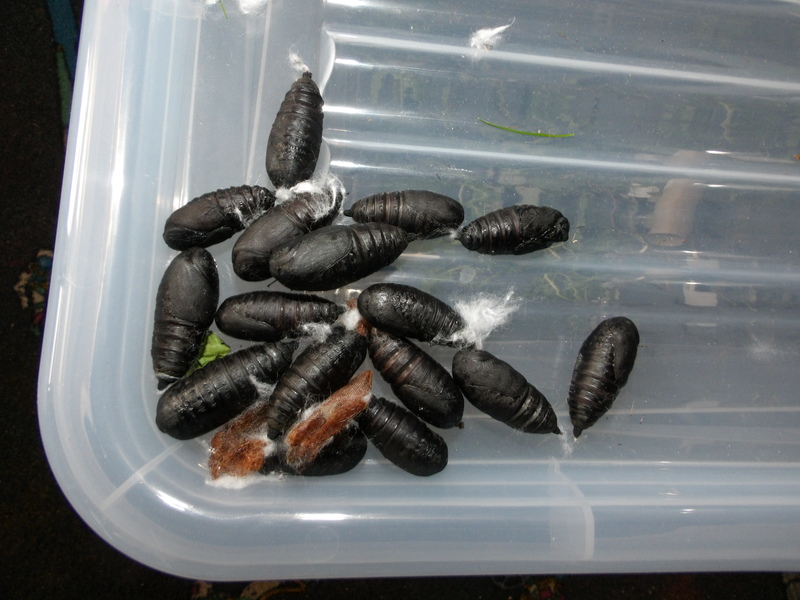 It seems their development time is quite long – it took me 2.5 to 3 months to raise them from eggs to cocoons. However, this was in the middle of winter (cold) and with what was perhaps an inferior food plant – I suspect it is possible to raise them faster in a warm room on a more nutritious plant (raspbery, oak or cherry?). 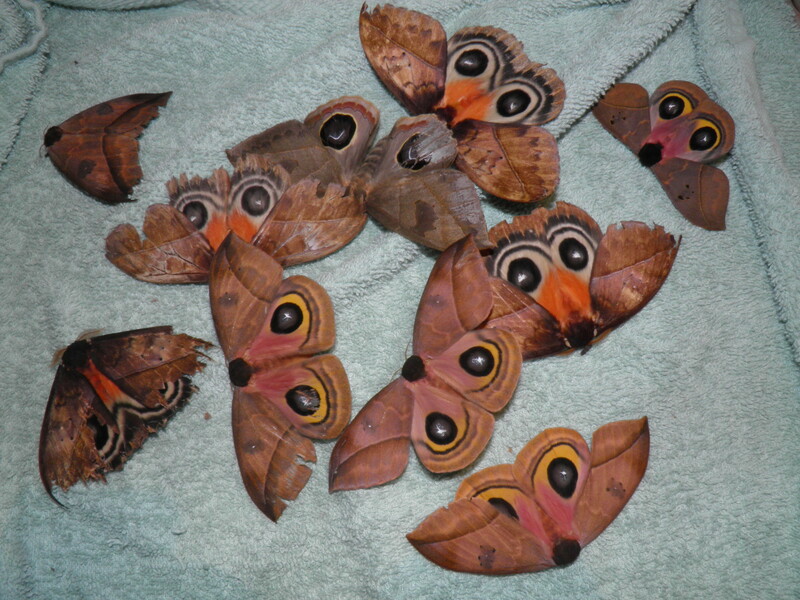 The adults of Automeris cf. niepelti are impressive – with big wingspans and bright colours. 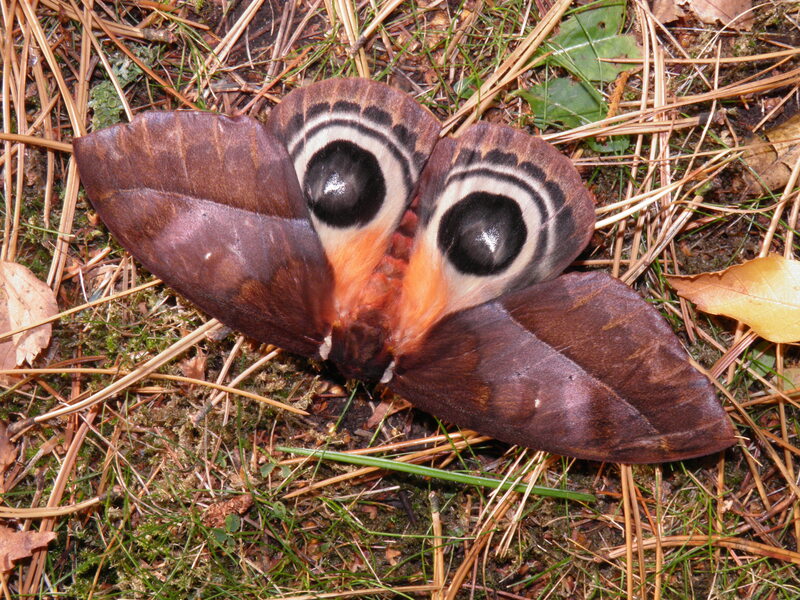 When resting, the hindwings are hidden below the forewings, and they look like a dead leaf- but if handled or molested they will flash the hindwings, in order to scare predators with their fake eyespots. Pairing them in captivity seems challenging – interestingly, I only managed to get two (2) pairing out of more or less fourty (40) cocoons. While I didn’t count how many pairs I had and what the male to female ratio was, for sure I had many pairs in captivity that just refused to pair, no matter what I tried. The two times I did get a pairing however, it happened at night – and I was sure not to put too much individuals together in one medium sized pop-up cage (the golden rule is one female per cage, and 1 to 3 males). Maybe it was the colder nights since I was breeding them in winter? It seems that not all individuals were interested in pairing. Despite this, I did get a few hundred fertile eggs out of two fresh females. 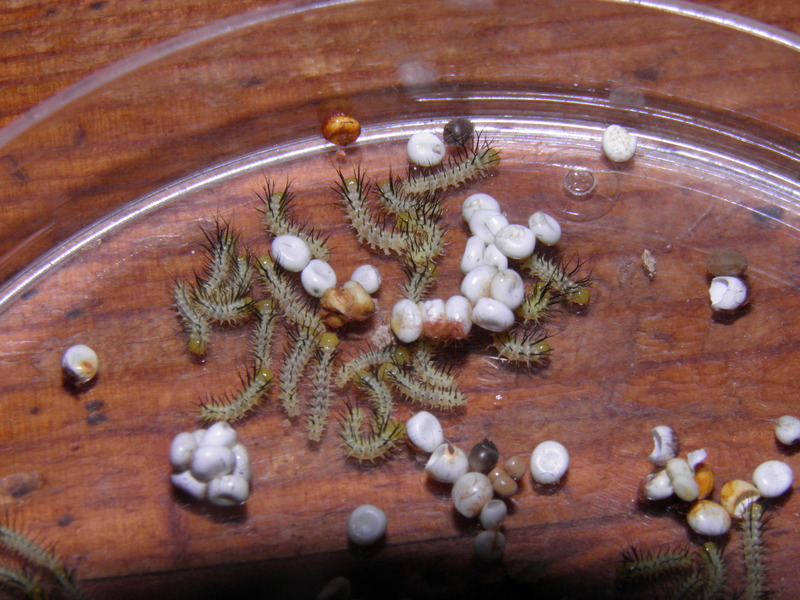 Eggs take about 1.5 month (6 weeks) to hatch. Insectnet (link) buy eggs and cocoons! Insectnet is one of the largest networks online where you can buy and sell moth eggs and cocoons. It is mainly based in the USA for USA breeders but also for the European hobby. Bantaey Srei Butterfly Centre A butterfly farm in Cambodia – where I personally worked as a consultant! A beautiful farm worth a visit if you are on vacation, or looking for pupae sales.